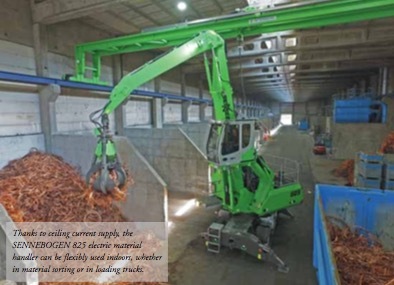 SENNEBOGEN 825 Mobile that is supplied with current via a ceiling crane at the Nickelhu¨tte Aue plant. SENNEBOGEN area sales manager Ronald Haupt and Stefan Rißel from the dealer Tecklenborg explain, “This solution is unique and simultaneously easy to implement.” They are talking about the new SENNEBOGEN 825 electric material handler that has recently started operation in scrap handling at Nickelhu¨tte Aue and is provided with energy via an ingenious ceiling power supply. The supply cable is guided along with the machine with each movement via a ceiling crane. A rotary feedthrough on the uppercarriage ensures that the cable is securely connected with the machine. As a result, the electrical machine can be flexibly moved in the hall without any restriction, and the floor always remains free from cables for trucks that enter and exit. ‘Committed to progress — connected to tradition’ is the motto that the company, founded in 1935, has followed from the beginning. Progress not only means specialization in the export of chemicals, metallic salts, non-ferrous scrap metals, copper alloy blocks, and concentrates to 45 countries worldwide but also the continuous improvement of the production conditions in the middle of the town of Aue in the Erzgebirge mountains. It is therefore no surprise that modern material handlers with an electric drive have been used at the nickel plant for several years. The machines, which sort, load, and move very different kinds of metal scrap in the halls, are especially economical and environmentally friendly even in continuous use. They easily achieve 50% savings in energy and operating costs compared to diesel machines. Especially when used indoors, the electric material handlers have the advantage of working trouble-free with high dust exposure; no filter changing is necessary and exhaust gases are a thing of the past. Only overcoming long distances was previously a challenge, which can now be eliminated with a tailor-made solution. The set-up is extremely simple and could be integrated in the existing hall structure. The powerful 110kW electric motor of the SENNEBOGEN 825 Mobile is powered on the uppercarriage via a supply cable that hangs from above. The ceiling crane, which covers 25m, can also be moved safely and conveniently over the entire 146m length of the hall. Regardless of the direction in which the machine moves, in which the uppercarriage is slewed, or in which the machine is turned, the ceiling crane with the crane trolley follows the machine without restriction and ensures maximum freedom of movement during indoor use. The ceiling crane is easily controlled via the deflection of the cable. If this is deflected in a particular direction, the crane bridge and crane trolley immediately follow, and the operator can concentrate completely on the loading work.